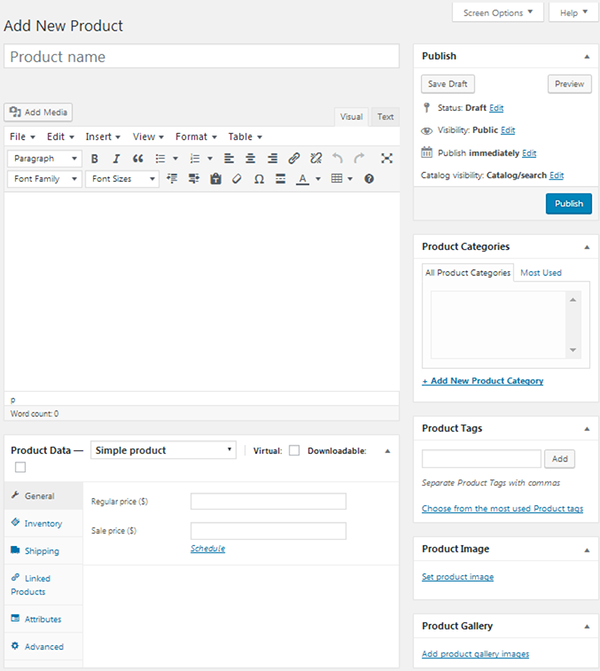 WooCommerce is a free WordPress plugin. At over 7 million downloads, it’s the most popular eCommerce solution for WordPress, and one of the most popular plugins in general. It and WordPress are so popular, WooCommerce powers over 35% of the world’s eCommerce sites. WooCommerce is not like all the other eCommerce platforms we’ve reviewed on this site. It’s an open-source plugin powered by an open-source platform, which means it can be much more powerful than all-in-one solutions in various ways but may also not be the best solution for those who shy away from technology. 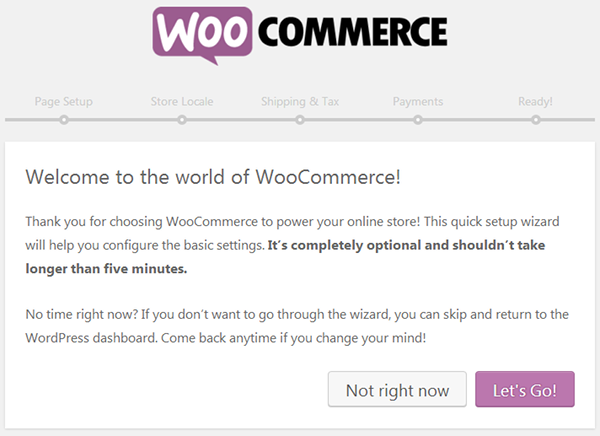 WooCommerce is the name of the plugin. WooThemes is the name of its developer. WooThemes was founded by Mark Forrester, Magnus Jepson, and Adii Pienaar. They released one of their most popular WordPress themes to date, Canvas, in 2010. The company was unsuccessful in its attempts to acquire a company by the name of Jigowatt in 2011 and legally forked the code for Jigowatt’s eCommerce WordPress plugin JigoShop in what has become one of the biggest controversies, and source for many heated debates about the morals of forking, in the WordPress community. Thus, WooCommerce was born. It has now grown into a beast of an eCommerce plugin, as stated earlier. Let’s take a look at the pros and cons of using this platform to build an eCommerce site. The advantages of using WooCommerce are a little different than the advantages of using a dedicated eCommerce platform, mainly because it’s a mega plugin you install on a platform. Let’s take a look at what you have to look forward to when you build an eCommerce store with WooCommerce. WooCommerce, much like WordPress, the platform you install it on, is a free and open-source solution. This means it has a core development team that works on the base plugin, but independent developers not associated with the team are allowed to produce their own plugins and themes to extend the functionality of the base plugin. It also means it’s not exclusively linked to a single product or platform. This is beneficial for a variety of different reasons. For starters, it means you aren’t limited to the server capabilities or pricing restrictions of an eCommerce platform. You can pick up your store and move it to any host or server. There are no limits to the amount of sales you can process or the amount of revenue your store can earn. All you need to do is move it anywhere you like if it outgrows its current server. You also won’t need to relearn a whole new platform or import/create each product manually as WooCommerce is linked to WordPress, which can be installed on numerous server types. This plugin also has one of the largest theme collections of any eCemmerce platform, more so than any all-in-one platform. Some of these are available from the WooCommerce website while others are available from third-party developers. Some are free while others are available at a premium price. Unfortunately, this means ease of use is dependant on the theme you use. This may be a con for some, but an open-source solution also means you have full control over the security and maintenance of your store. You can use any security plugin or service you want and use any SSL certificate you please. You aren’t under any restrictions from the platform you use, and you also don’t need to put all of your trust in them as the open-source solution allows you to make sure things are taken care of firsthand. Lastly, there are more integration options with an open-source platform. We’ll talk about the integrations available for this plugin throughout this review. Other payment gateways can be added through extensions, still free of charge. 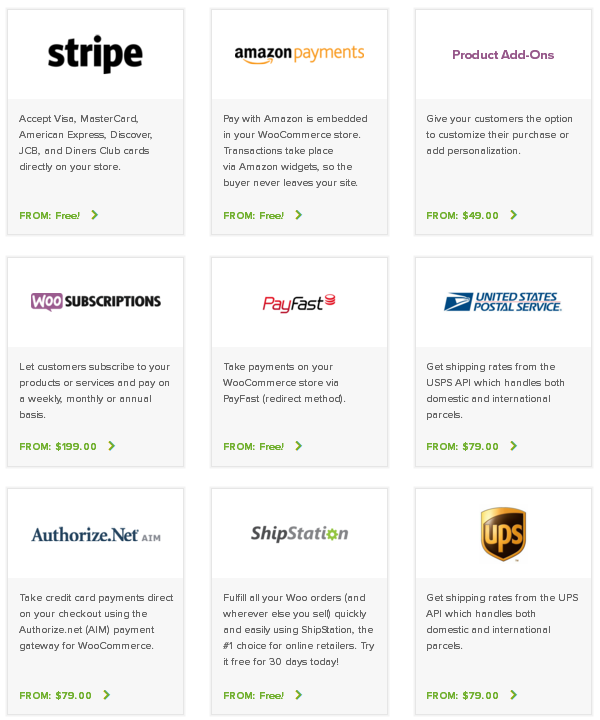 They include Amazon Payments and Stripe. Some are available at premium prices, but we’ll get to that later. WooCommerce is a powerful eCommerce platform, so powerful, it allows you to sell virtually anything on your site. It starts with the typical physical and digital products you’d sell on an eCommerce store, but it continues with things like courses, memberships, subscriptions, and bookings. WooCommerce has a lot free and premium shipping plugins and extensions, which we’ll get to in a bit, bud you’d be surprised by how many shipping features it packs into the core version of the plugin. Selects the cheapest shipping method available. It also includes a shipping calculator you can enable on individual product pages as well as the shopping cart page. You can also hide shipping costs altogether until your customer enters an address. There are also a number of different location-related options you can take advantage of. This includes the ability to restrict shipping destinations based on location as well as the ability to create shipping zones. You can create different shipping zones for different regions and locations and assign different shipping methods and rates to those zones. There are also a number of different free and premium plugins and extensions available for WooCommerce, as I mentioned above. Some are available on the official website. Some are available on WordPress.org. Some are available on marketplaces like CodeCanyon while others are available on individual developers’ websites. These plugins add a variety of different functionalities to your website, including the ability to print invoices and shipping labels, the ability to track shipments as well as the ability to enable postcode/address validity. 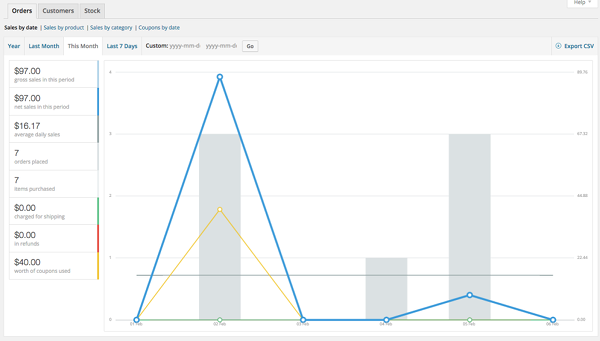 The marketing and SEO capabilities of the core plugin are modest, but they’re still pretty useful. This includes the SEO benefits built into the core version of WordPress. You can also install several different plugins, such as Yoast, to enhance the SEO capabilities of your store. WooCommerce has an easy setup process after you install and activate the plugin. This includes installing core WooCommerce pages, such as Cart, Checkout and Shop, entering location information, such as which currency and units of measurement you use as well as setting up shipping, sales tax and payment gateways. Creating new products is simple with WooCommerce. You start off by entering a name and description as you would with any other ecommerce platform. You can also choose a product type, from Simple Product to Variable Product, and mark the product as a Virtual or Downloadable product. You can also add a general price, a sale price, an SKU code and shipping information, specifically the weight, dimensions and shipping class the product has. Products can also be organized into parent categories, child categories and tags. You can also add variants to products with attributes. Managing your store is also easy with WooCommerce. The dashboard has a snapshot of your store’s success and progress that shows the amount of sales you’ve received, the amount of traffic you’ve received and an at-a-glance summary of your shop. WooCommerce is a WordPress plugin developed exclusively for the CMS. This means you’re able to integrate WordPress’ powerful blogging capabilities into your store. These capabilities include enhanced SEO, multiple layouts and styles depending on the theme and plugins you use, plugins that extend your blog’s functionality, and more. WooCommerce is a powerful plugin that jam-packs a lot of different features into the core version, but it does have its faults. The first one is also at the top of the pros list as this feature can be a pro and a con depending on the way you perceive it. This is a pro for some, the reasons of which are stated at the top of the pros list, but WooCommerce’s open-source and self-hosted nature may be a con for some. This is because it will require those who are not technically-inclined to do a lot of research into what web host to use, what server type to use, how to install WordPress, how to set up WordPress, how to install and set up WooCommerce, and so on and so forth. You’ll also need to learn about WordPress security and security practices for eCommerce in general, such as protecting your users’ data with an SSL certificate and enabling HTTPS on your site. Lastly, store management is entirely up to you. Sure, you can receive support from the developers of WooCommerce as well as other users, but it’s not the same as the dedicated support or account management you’ll receive from all-in-one eCommerce platforms. Extensions, well, extend the functionality of the core version of WooCommerce. Some are free, some are moderately priced, but others are expensive and can truly add to your store’s startup costs. For example, adding USPS, UPS, FedEx, Canada Post, Royal Mail and Australia Post as integrated shipping carriers will cost $79/year each. 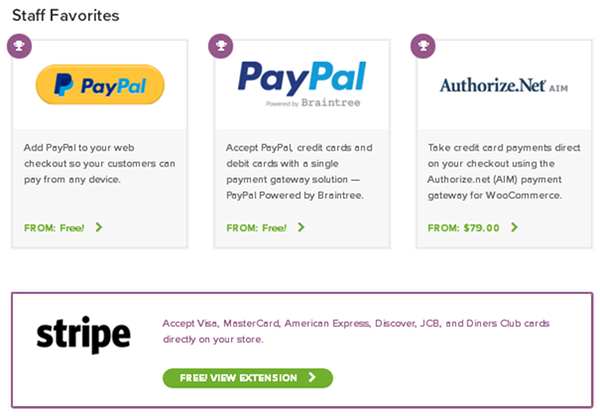 Adding certain payment gateways, such as Authorize.net, costs $79/year. Adding booking features to your site will cost $249/year, and adding subscriptions will cost $199/year. Expect to pay more to set up your store if it needs these types of features. I mentioned this in Con 1, but I’ll talk about it a little more here. WooCommerce does not offer 24/7 support, which is a major con for store owners who need their businesses to run 24 hours a day, 7 days a week and 365 days a year. They offer support during set hours Monday through Friday. They also don’t offer live chat or phone support nor any kind of a priority support system. They do, however, offer an extensive documentation and blog. WooCommerce is a powerful eCommerce solution, and I highly recommend it to those who are willing to put in a little extra work to learn the ins and outs of self-hosting a website with WordPress. If you aren’t willing to do this, I highly recommend looking at an all-in-one solution, such as Shopify (our review) or BigCommerce (our review).